Only four Senators attended, a number that did not include Chairman Kerry. On the email front, I’m struck by a certain comparison. 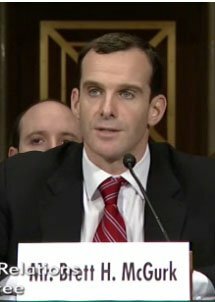 McGurk’s many emails have gotten not even a peep from DOS. But do you recall what happened to Blake over the one flirty email he sent on his office computer to that female O-3? Pays to know people in higher places than an e-PRT. P.S. McCain didn’t come to the hearing because he’s not a member of the Foreign Relations Committee and so, in effect, isn’t invited.